The process of using ImageBrowser EX to download images from your Rebel t5i is a little different depending on whether you’re sending photos directly from the camera or from a card reader. 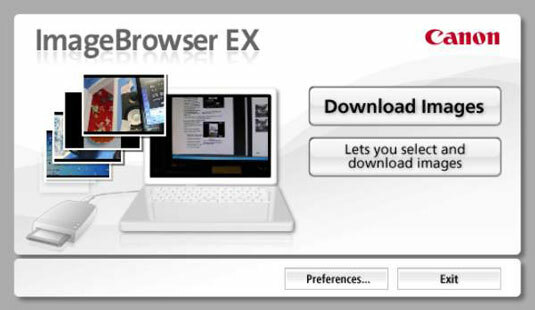 Note: The Windows version of the software has the same options as the Mac version, although sometimes with a slightly different visual design. The launching pad for downloading from the camera is Canon EOS Utility. This window may pop up automatically after you connect your camera to the computer, or your operating software may offer a link to launch the tool. If neither of those things happens, start ImageBrowser EX, click the Import Settings icon at the top of the window, and choose Connect to EOS Camera. 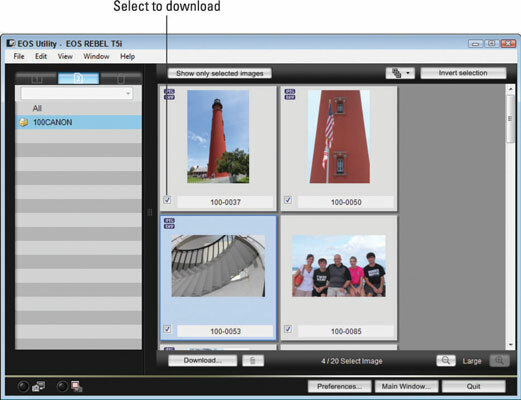 Click the Lets You Select and Download Images option. 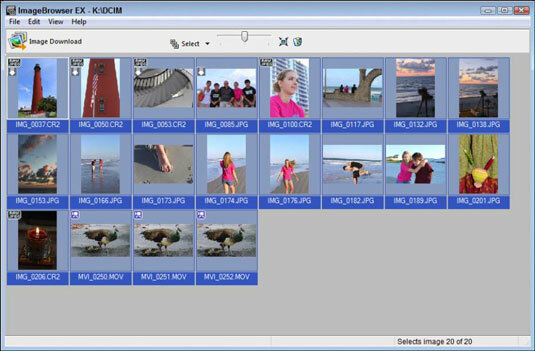 You see a browser window with thumbnails of the images on your memory card. Click the magnifying glass icons in the lower-right corner of the window to enlarge or reduce the thumbnail size. Select the images you want to copy to the computer. Each thumbnail contains a check box in its lower-left corner. To select an image for downloading, click the box to put a check mark in it. A screen appears that tells you where the program wants to store your downloaded pictures. By default, pictures are stored in the Pictures or my Pictures folder in Windows (depending on the version of Windows you use) and in the Pictures folder on a Mac. You can put images anywhere you like; however, most photo-editing programs look first for photos in those folders, so sticking with this universally accepted setup makes some sense. Verify or change the storage location for your pictures. If you want to put the pictures in a location different from the one the program suggests, click the Destination Folder button and then select the storage location and folder name you prefer. Click OK to begin the download. A progress window appears, showing you the status of the download. When the download is complete, turn off the camera. You can then safely remove the cable connecting it to the computer. 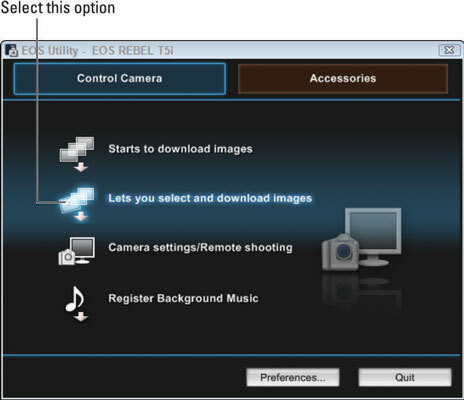 Setting download preferences: While the camera is connected and turned on, click the Preferences button at the bottom of the EOS Utility browser to open the Preferences dialog box, where you can specify many aspects of the transfer process. 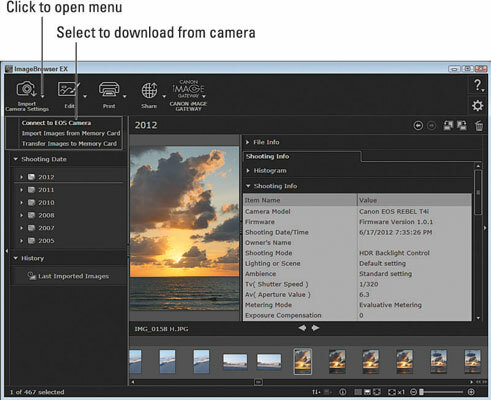 Auto-launching the other Canon programs: After the download is complete, the EOS Utility may automatically launch Canon Digital Photo Professional or ImageBrowser EX so that you can immediately start working with your pictures. Visit the Linked Software panel of the EOS Utility’s Preferences dialog box to specify which software you want to use or choose None to disable auto-launch altogether. Closing the EOS Utility: The browser window doesn’t close automatically after the download is complete. You must return to it and click the Quit button in the lower-right corner to shut it down. After you put your camera memory card into a card reader, the dialog box may appear automatically. This window is the jump-off point for memory-card transfers. 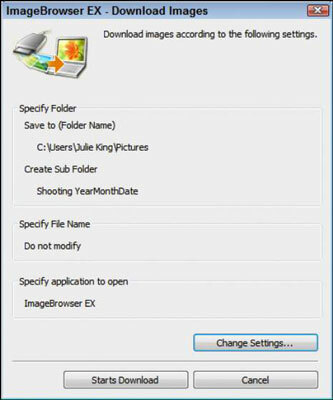 If you don’t see it after a few moments, you can access it by opening ImageBrowser EX, opening the Import Camera Settings menu, and selecting Import Images from Memory Card. Note that depending on your operating system and the program preferences you install, the dialog box may also have an option to print directly from the memory card. You see the browser window. Select the images you want to download. To select the first photo: Click its thumbnail. To select additional pictures: Ctrl+click (Windows) or cmd+click (Mac) their thumbnails. If you want to select several contiguous photos, select the first, press and hold Shift, and then click the last photo of the group. To quickly select all images: Press Ctrl+A in Windows or cmd+A on a Mac. Click the Image Download button. A new window opens to show you where the downloader wants to put your files and the name it plans to assign the storage folder. If you’re not happy with the program’s choices, click the Change Settings button to open a dialog box where you can select a different storage location. In the same dialog box, you can also choose to have the files renamed when they’re copied. Click OK to close the Change Settings dialog box. Click the Starts Download button. Your files start making their way to your computer. When the download is finished, your pictures appear in ImageBrowser EX. You must close the downloader windows yourself; they don’t automatically disappear.